We believe in providing best and premium Quality CNC Laser cutting and sheet metal products at Gajjar Industries. Gajjar Industries is dedicated to satisfying its customer by delivering quality products at the tip of perfection. The products are ensured best quality as per the predetermined standards & specification through state-of-art technologies, specialized knowledge & Know-how. Quality is our priority at each and every step. We follow a structured procedure and company policy to exceed our customer expectations. We maintain records and analyze the raw materials purchased for processing the order. We encourage refreshing ideas, suggestions, methodology to constantly improve our practices. In the case of product defect, our inspection department conducts an in-depth study to find the root cause of the issue in order to avoid recurrence. Apart from the manual intervention, the latest software is used to keep an eye on the manufacturing issues. Quality at Gajjar Industries is flawless as we have the right inspection department who ensures verification at every stage of the process. 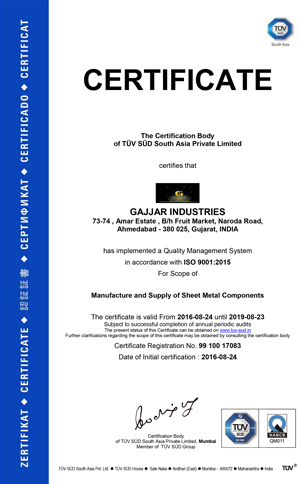 You can definitely trust Gajjar Industries and rest assured for the best quality CNC Laser cutting and sheet metal components.